Today is the golden age of effects pedals. There are more available now than at any other time in history. The varieties of artistic expression that go into the design and construction of these devices is both surprising and mind-boggling. Thus, the exhibition has been developed to focus on the look of the pedals, as well as their sound. Special focus is placed on the industrial design of the pedal enclosures as well as the growing movement of designer art-stompboxes produced by individual builders’ “boutique companies,” often in collaboration with artists. Sometimes these pedals are hand-painted and other times the surface graphics are applied with silkscreen or other novel application techniques. 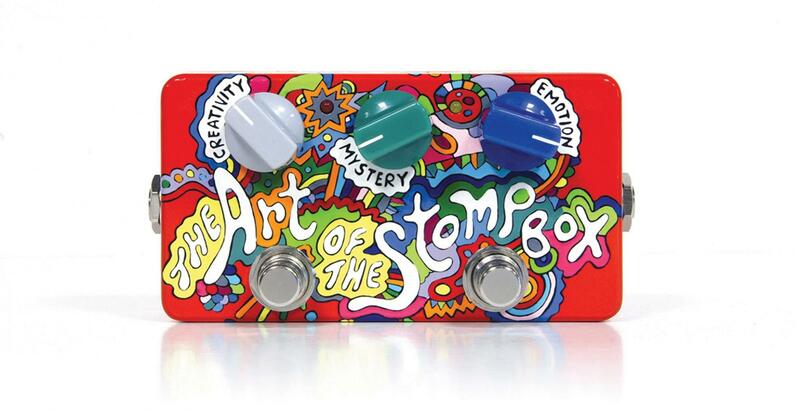 The stompbox movement reflects an increasing emphasis on the use of effects as tools to achieve unique and signature expressions in sound and tone. Musicians not only aspire to reproduce classic sounds and effects from past musical icons, but also push to create new sounds. This sound that originates from within the mind of the artist must first be produced physically on the instrument, carefully altered and processed through layers of interfaces or devices—in which effects pedals play a principal role in what is heard. Here art and science are married to become a dynamic medium of expression. At the fundamental level, effects pedals and other sound processing devices are an extension of the musician’s palette, providing an array of sonic hues they may whet their instrumental brush. The exhibition has been developed in close collaboration with experimental musician and guitarist Henry Kaiser, acclaimed for his expressive use of effects; the UCSD Jacobs School of Rock, and students from the UCSD Department of Visual Arts and Department of Music.